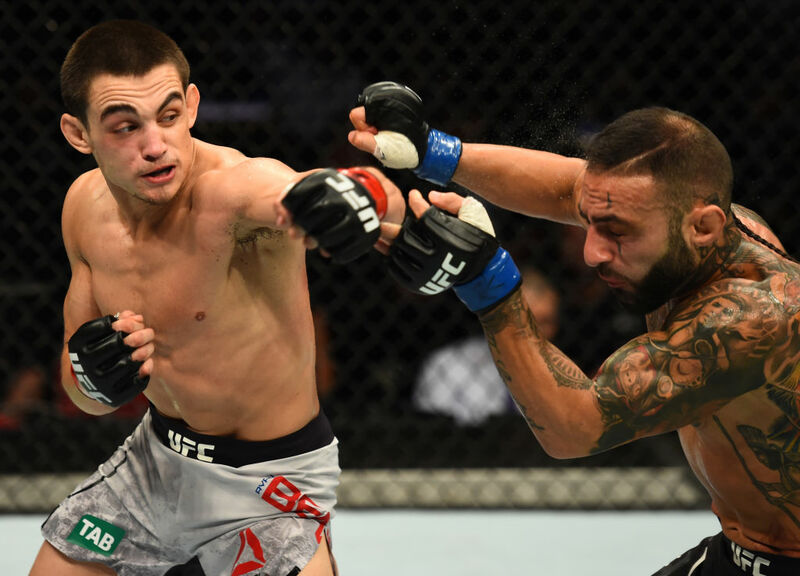 Returning to the Octagon for the first time since December 2016, flyweight prospect Ryan Benoit got back in the win column as well at Qudos Bank Arena in Sydney, halting Ashkan Mokhtarian in the third round of their UFC Fight Night bout. After some lateral movement around the Octagon in the opening stages of the bout, Mokhtarian’s first left hand staggered Benoit. Benoit shook it off but was rocked a few moments later by the same punch. Getting his bearings back, Benoit began working his way into the fight, and when Mokhtarian was in range, he got some hard shots off, with a hard combination jarring the Aussie at the horn. Between rounds, Benoit told his corner his right hand was broken, but his kick to the head was working fine as he rattled Mokhtarian early in the second stanza. Mokhtarian settled down and had success fielding the rushes of Benoit, but again, the Texan went on the attack late, with a takedown and some ground strikes finishing up the round for him in style. Benoit kept stalking in the final round, and after getting caught by a quick punch from Mokhtarian, he ended the fight in sudden fashion with a right kick to the head that sent Mokhtarian to the canvas and brought referee Steve Perceval in to stop the bout at 2:38 of the third frame. Benoit, who missed weight, coming in at 129 pounds, moves to 10-5 with the win; Mokhtarian falls to 13-3. 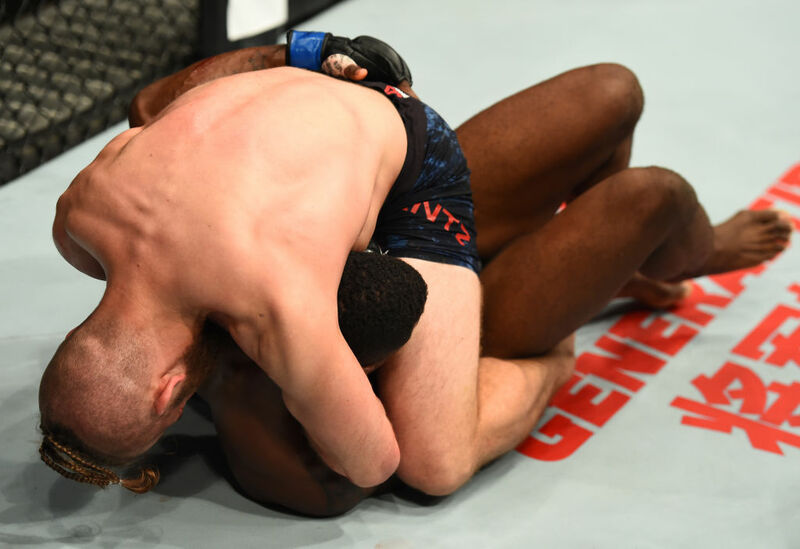 In a clash of former teammates, lightweight veteran Nik Lentz took home South Florida bragging rights with a second-round submission win over Will Brooks. Brooks had success with his standup in the first two rounds, but Lentz provided an omen of things to come in the opening frame when he nearly sunk in a guillotine choke on a Brooks takedown. And while he didn’t nail it then, in the second he did, locking in the guillotine that forced Brooks to tap at 2:05 of round two. With the win, Lentz moves to 30-8-2 with 1 NC. Brooks falls to 18-4. Western Sydney’s Tui Tuivasa had the fans roaring in his UFC debut and he didn’t disappoint, knocking out Rashad Coulter in the first round. It was clear from the start that the two heavyweights weren’t going to keep the fast pace they were on for three rounds, and in the final minute of the opening frame, Tuivasa made sure they wouldn’t have to, as he knocked Coulter off balance with a kick to the leg and then ended the fight with a knee to the head that put the Texan down and out. The official time of referee John Sharp’s stoppage was 4:35 of round one. With the win, Tuivasa ups his record to 8-0; Coulter falls to 8-3. Lightweights Frank Camacho and Damien Brown put on a brawl to remember, with Camacho emerging victorious from the 15-minute battle via split decision. Scores were 30-27, 29-28 and 28-29 for Camacho, now 21-5. Brown falls to 17-11. As expected, the two delivered a fast pace throughout the opening round, Camacho doing solid work on the inside against the fence before Brown roared back in the final minute and nearly secured a rear naked choke. Brown and Camacho kept it standing in the second, taking turns chin checking each other. Camacho held the edge in volume as he unleashed power shots on Brown, but the bloodied Brisbane product wasn’t going anywhere, and again, he finished the round strong. Neither fighter gave ground in the third round, with each battler showing remarkable heart and determination as they exchanged bombs for the final five minutes as the crowd roared. When it was over, Camacho got the decision, but there were no losers in this one. Camacho missed weight for the bout, coming in at 160 pounds. Unbeaten Aussie strawweight phenom Nadia Kassem went past 87 seconds for the first time in her pro career, but it didn’t seem to affect her performance, as she won her Octagon debut against Alex Chambers via unanimous decision. Chambers (5-4) looked to close the distance as the bout began, and while she took some punches and kicks from Kassem, soon she had her foe on the canvas. Kassem defended well on the mat and nearly secured a leg lock, but Chambers escaped and ended the round with some hard ground strikes. Kassem scored with more punches and kicks to start round two, and after avoiding another stay on the canvas, she stayed ahead in the standup game. Chambers got her takedown with a little under three minutes to go, but Kassem locked in a triangle choke and then sought an armbar, only to be foiled. Kassem kept the heat on, though, landing some ground strikes before the end of the round. Fatigue was a factor in the third round, and some showboating by Kassem led to another takedown by Chambers. Kassem impressively kept looking for submissions, but Chambers escaped and the two rose. Kassem scored with a flush head kick late in the bout, and while Chambers shook it off, the damage had been done and Kassem moved to 5-0 by scores of 29-28 and 29-27 twice. Kassem missed weight for the bout, coming in at 120 pounds. After two close split decision losses to open his UFC career, Eric Shelton broke into the Octagon win column with a workmanlike three-round unanimous decision victory over Jenel Lausa in flyweight action. Scores were 30-27, 30-26, 30-25. Both fighters had their moments in a close first round, but it was Shelton who held the advantage thanks to a 2-1 edge in takedowns. Shelton put Lausa on the mat early in round two and landed several hard blows from the top, dodging a couple guillotine choke attempts along the way as he kept “The Demolition Man” grounded for the rest of the frame. The third was more of the same, as Shelton stuck to what was working on the ground, allowing him to wrap up the round and the decision. With the win, Shelton moves to 11-4; Lausa falls to 7-4. Polish heavyweight Adam Wieczorek picked up his first UFC win in the opener, as he debuted with a close, but unanimous, decision victory over veteran Anthony Hamilton. Hamilton (15-9) did a good job of breaking his string of three first-round losses in round one, taking Wieczorek (9-1) down in the opening minute of the fight and keeping him there until the closing 49 seconds. Wieczorek came out fast for the second, though, and a kick to the head put Hamilton on the mat. Now it was time for Wieczorek to work his ground game. Wieczorek got off some hard strikes, but midway through the round Hamilton got back to his feet and the two fought on fairly even terms until a takedown by the “Freight Train” in the final minute. The third was close as the combatants battled fatigue as much as each other, but in the end, Wieczorek did enough to take the win by three scores of 29-28.